What is the best way to highlight my Bible? What is the best way to highlight my Bible? If you haven’t written in your Bible, but you’re considering doing so, this might be a question you’re asking. Once pen is on the paper it can’t be removed, so having a good approach to start with can ensure consistency and ultimately will add to the usefulness of the exercise, and your Bible once it’s been marked up. In this article, we’ll consider briefly the best tools for marking up your Bible and then 3 methods you might like to consider for highlighting your Bible. When it comes to pens, the most important consideration is how it transfers to paper. There are two categories of pens, one is ballpoint which rolls the ink onto the page and the other works by transferring the ink to the page on contact. Ballpoints require a certain amount of pressure to work (the poorer the quality of pen, the more pressure). The ink on a good ballpoint transfers reliably, but if you have to leave an indentation on the page to transfer the ink, this advantage diminishes. On the other side, ink transfer pens don’t require any pressure, but often the ink will aggressively seep through the page, or if the ink is low, it will not leave a consistent mark. Fortunately, there are pens and highlighters on the market that are ideal for marking up your Bible. In terms of pens, I use these Pigma Micron pens. These have a thin nib (as little is 0.5 mm), though larger sizes are available. The thinner tip means I can write very small, even in between lines if I want to. These are ink transfer style pens but the ink they use is a pigment based ink which doesn’t bleed through at all. And because they transfer the ink on contact, you don’t need to press hard. The best highlighters I’ve found are the Zebra highlighters from G T Luscombe (I use this pack). Like the Pigma Micron pens, these also use an ink that doesn’t bleed through. In addition, they are double tipped, with a chisel tip at one end and a pointed tip at the other. I tend to use the pointed tip most of the time, because I prefer a more subtle look. These pens and highlighters retain their color well over time. I started marking up my Bible several years ago with these pens and most of the markings look the just as bright today as they did when they were first marked. When highlighting based on relevance, the question is, how is this text relevant to me? If you’ve worked through a heart goal, or a growth goal, you already will have an ideal of what is relevant to you based on the areas you want to grow in. With this knowledge, you can highlight passages by color based on how relevant they are, where the strength of the color indicates the degree of relevance. For example, if I have (or have had) a heart goal to work on my anger and I’m reading through James, I will encounter a number of verses relevant to me personally, such as James 4:1-3. Other verses will also support the concept of anger (such as patience, or trusting the Lord), but will be less direct. For this reason, I might highlight James 4:1-3 in a bold color due to its high relevance (e.g. pink) and some of the supporting passages in a slightly more subtle color, such as James 1:13-15 in green or yellow. The same might apply for promises and warnings. A promise or warning that is highly relevant to me could have a bold color, where one that is important but less relevant would be less bold. An example here may be Proverbs 25:28, which is a warning not to lose control of my temper. One thing to watch out for with this method is the tendency to highlight passages based on how relevant it might be to someone else. If you’re married, you might read a verse that stands out about your spouse or a close friend. Resist the temptation to highlight it. The idea is to focus on the relevance of the Word for you, not for others. We can’t change others, all we can do is submit our own heart to the authority of scripture and ask the Lord to help us change. Moving away from specific relevance to us, this method considers that nature of the text we are considering in scripture. Using this approach highlights a sentence based on why it is there. I’ve broken this into four different purposes: is the sentence a command, a promise or warning, a condition, or proposition (truth). A command is a request or instruction that expects or demands compliance. These are sometimes unqualified, such as “love the Lord your God with all your heart soul mind and strength” and sometimes they are qualified. Qualifications can be conditions (if/then or when/then statements with a command) or contextual (e.g. many elements of the Old Testament law are rooted in the Mosaic covenant initiated in Ex 19:5-6). We can trace even contextual commands to higher purposes, such as the holiness of God. Promises and warnings are closely related things that may or will happen in the future. Like commands, these are often conditional. For example in Rom 8:28-30, the condition is “for those who love God.” The promises that follow are true only for those who love God. Warnings are similar in that they often accompany conditions. In the letter to the church in Sardis, Christ warns the church that He will come like a thief and catch them unaware, but this is dependent on the condition, “if you will not wake up” (Rev 3:3). If you have five colors, you might like to color promises and warnings differently and then the condition in a different color. 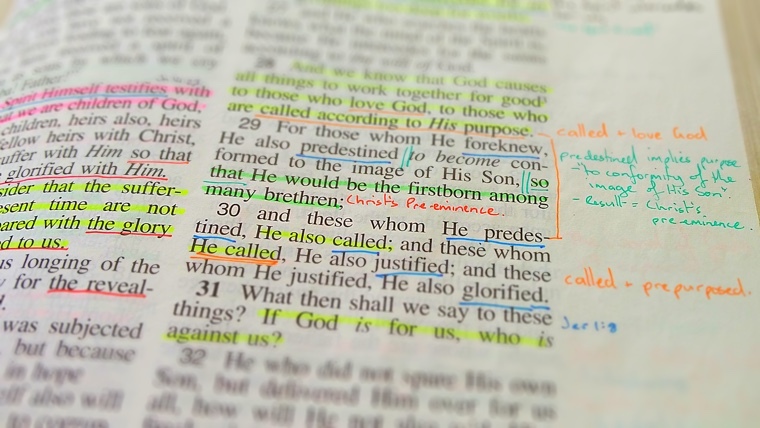 Highlighting passages in this way will help you think about what you’re reading more carefully, and it will help you grow in your appreciation of what God calls us to (promises and commands) and how He sees the world we live in. Dr Harris is a professor of Bible Exposition at the Master’s Seminary, who has a writing ministry, and a blog . He uses a system for highlighting the Bible based on the outline of a text. It is a little more complicated than the previous two methods, but is highly rewarding. Dr Harris uses five colors for this process along with outline letters and numbers; “yellow would be the primary point (I), blue would be anything supporting the primary (A), green supports blue (1), pink supports green (a), and purple supports pink (i).” He includes several examples that clarify how he does this. For the full details of this method, read Dr Harris’ article at glorybooks.org. So if you’ve been wondering, “What is the best way to highlight my Bible?” these methods should start your thinking. Ultimately the best way to highlight your Bible is the way that is meaningful and sustainable for you. Don’t be afraid to mix and match methods.